In 2011 whilst on a visit to Canada Andi Webster met up with Kara Anderson one of Kunavelela’s long time supporters to discuss project progress and the way forward. Kara put together the “Say Something” fundraising campaign and assisted in raising funds to sink the borehole for the vegetable garden. 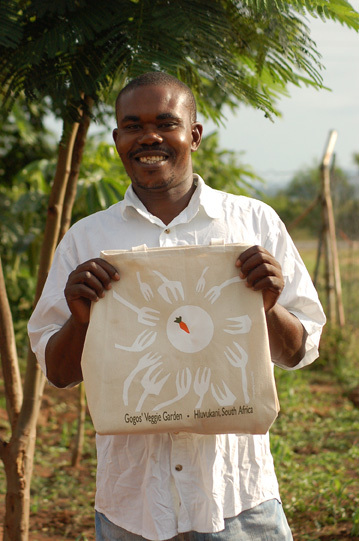 In 2010 Kara raised funds for Kunavelela by selling tote bags with the veg garden logo (designed by Corey Mah) and proceeds were put toward soccer as well as purchasing much needed school supplies for children in the village. Earlier in 2011 Westend Football Juniors in collaboration with G.A.S.E. Marine organized the delivery of a significant number of uniforms that were collected over a period of time. This entry was posted in community, Donations, Uncategorized. Bookmark the permalink.